"What’s more exciting to a kid than this?" one parent in the line asked. New York's most beloved toy store is back, this time at Rockefeller Center. 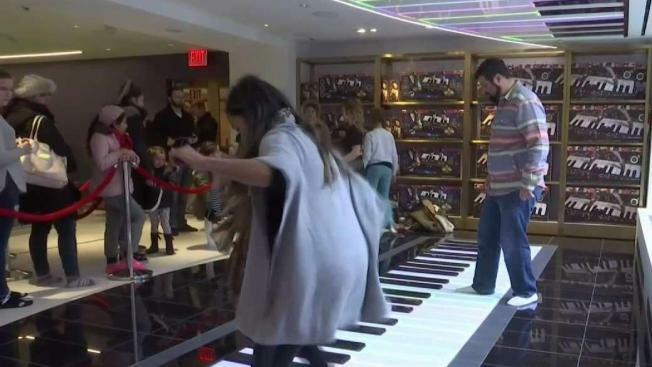 Parents and children were lined up around the block in melting snow to be the first to play and shop in the newly reopened FAO Schwarz Friday. Three years after it closed its beloved toy store on Fifth Avenue, FAO Schwarz opened its door again in Rockefeller Center, about 10 blocks from its former home near Central Park. In a line that wrapped all the way around the block, eager shoppers waited for almost an hour for the high-end store to officially open with the ribbon cutting ceremony. In recent weeks at 30 Rockefeller Plaza, workers drilled, hammered and sawed 24 hours a day to get the new store ready. Employees filled shelves with hundreds of plush animals that have long defined the brand — bears, bunnies, elephants, chicks and more. The big entrance clock tower has returned. And on the second level of the 20,000-square-foot space is a giant piano keyboard mat like the one on which Tom Hanks danced to "Heart and Soul" in the 1988 film "Big." There is also a toy grocery store where children can shop among artificial produce, complete with small carts, a checkout counter and kitchen supplies. For $75, another interactive station allows kids to adopt baby dolls, while a "nurse" gives lessons on how to care for them. Live magic shows will be staged nearby, next to a spot for assembling custom remote-control cars. A 27-foot-tall rocket ship teems with stuffed bear astronauts. "We are about experiences. That's what's different from other toy stores," said David Niggli, FAO's chief merchandising officer. FAO Schwarz has gone through multiple corporate takeovers in recent years as retailers struggled to adapt to online sales. It was purchased in 2002 by Right Start Inc., which filed for bankruptcy twice. Toys "R'' Us was the next owner. It sold the FAO name to the California-based ThreeSixty Brands in 2016 before recently declaring bankruptcy itself. "We have beautiful artisan pieces here, like rocking horses, but we also have items that are $10," Niggli said. "There's always going to be some of those over-the-top items. I think that's part of what you come to FAO to see. It's part of the magic." "That's the core of FAO. It's the classics plus the 'Oh, wow' things you've never seen before,"Niggli said.